Mohit Shetty talks about languages as if they are people. “Tamil is missing.” “Is Hindi on its way?” “Telugu will be here by evening, right?” he asks his team over the phone. 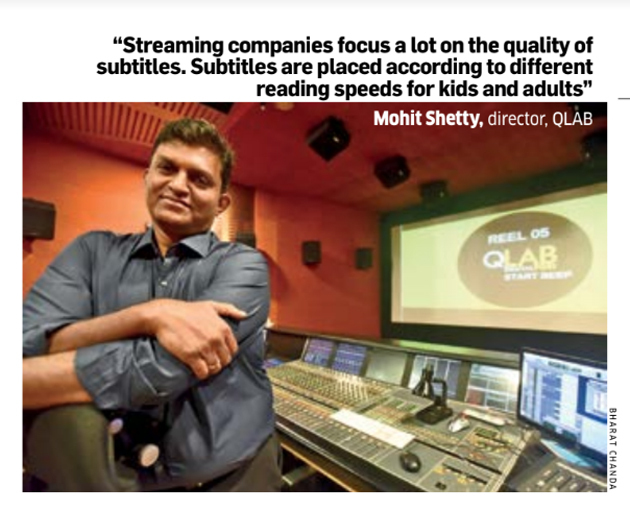 In the last six months, Shetty’s post-production company QLAB has subtitled 3,600 hours of English content for streaming platforms. To put things into perspective: that’s 30 times the content of the Friends sitcom that had 236 episodes, each running for about half an hour. Things weren’t as crazy some time ago. Subtitles were always a part of QLAB’s offering. But only films that travelled abroad — through the film festival or distribution route — were subtitled. Then, a decade ago, producers such as Warner Bros. started adding English subtitles to their English films for India, he recalls. Some of this subtitling happened locally because back then, subtitles were laser-printed at the bottom of a film’s reel, letter by letter, frame by frame. So the process depended on how many film prints a distributor could sell. The scope was limited. India was essentially a dubbing market. Subtitling was a last minute job, rarely given to professionals. Writers, who didn’t know any better, would attempt literal translations. The result: shoddy, laughable subtitles that often found their way onto a parody Tumblrpage called Paagal Subtitle. In the last two years though, global streaming platforms such as Netflix and Amazon Prime have disrupted the subtitling scene in India. They aimed to expand the audience base for their existing content library, primarily in English. For that, content localisation was the way to go. Subtitles were the first step in that direction because dubbing would cost 10 times more. There were exceptions, like Narcos. The Netflix show that narrates Columbian drug lord Pablo Escobar’s story in Español (Spanish) has been dubbed and subtitled in Hindi, among English and other languages. However, not every project has the same budget. Last year, Netflix launched an Indian original series called Sacred Games based on writer Vikram Chandra’s eponymous novel. It was dubbed in four languages but subtitled in 24. “Two out of every three Sacred Games viewers were from outside India,” a Netflix spokesperson tells ET Magazine. Netflix currently provides subtitles in over 25 different languages. Amazon Prime did not respond to queries regarding its subtitling strategy for India. As part of its streaming service launch, video platform MX Player is subtitling 100,000 hours of licenced Hindi content in English, says chief content officer Gautam Talwar. (MX Player is a part of The Times Group, which publishes ET Magazine). All this subtitling demand has prompted companies to shape themselves as Language Service Providers or LSPs. Shetty’s QLAB is one such company, Vista India is another. Global content localisation players such as BTI Studios, Deluxe and SDI Media have either set shop in India or are planning to. Prime Focus Technologies (PFT) is another such global player popular in the Indian media & entertainment circuit. Last year, it clocked 40,000 hours of subtitling work globally and 70% of that came from India. Majority of subtitling work from India still involves translating content from seven major regional languages into English. “But OTT (over the top) players have expanded to language subtitles. 7% of all India projects involve subtitling English content into Hindi, Tamil, Telugu, Bangla, and Marathi,” says Ramki Sankaranarayanan, founder & global chief executive of PFT. In 2017, YouTube introduced automated captions (YouTube algorithm-generated translation of audio). These captions – activated by clicking the ‘CC’ icon -are now available in 10 languages for over a billion videos. “At this point, users watch videos enabled with these captions 15 million times a day,” says Satya Raghavan, director of partnerships for YouTube in India. “Today, leading Indian creator Bhuvan Bam uses captions and subtitles to reach a wider audience. Dice Media does both Hindi and English subtitling for its web series. A lot of Indian users watch K-pop and Korean beauty videos with automated captions,” he adds. Slowly but surely, India is turning into a subtitling market. If you’re a global LSP offering a bouquet of 40 languages, your pay will be 1.5 times as much as any Indian LSP that can offer only five languages at most. Indian LSPs are still struggling to find talent in regional language subtitling. The fonts for most of these languages are also underdeveloped. Some languages come with unique challenges. For instance, Tamil. “It is not a telegraphic language and subtitling requires brevity,” says Nandini Sridhar, a Tamil localisation expert. Telugu subtitler Bhushan Kalyan often struggles to replace English profanities with an apt word in his lyrical mother tongue, referred to as “the Italian of the east”. Hindi-to-English subtitling tends to command higher rates than English-to-Hindi or any other regional language here. Average industry rate for subtitling a new Hindi movie into English is in the range of Rs 1-2 lakh. Veterans may even charge higher. For the southern market, this range comes down to Rs 50,000-75,000. Rookies may work for as low as Rs 20,000. Undercutting and haggling are normal. But when you undercut on price, you compromise on quality. And the new breed of content platforms won’t bear the latter. The quality of subtitles is critical for them for two reasons: One, unlike on TV or in a theatre, here users can tap, pinch and zoom in on a glaring subtitle error and splash it all over social media (visit Paagal Subtitle). Two, they also want users to better understand foreign content in a familiar language. It’s not an easy job. Subtitlers get a laundry list of guidelines to adhere to. The first of those include fitting every subtitle per frame in a ‘42 into 2’ format, which means ‘only 42 characters in each line, and only two lines, per frame’. “Subtitles are placed according to different reading speeds for kids and adults,” says Shetty. For kids, one often sees subtitle-placing based on the location of audio, he says. “You can’t use glyphs (nukta in Urdu) for words like zindagi and khatra during Hindi subtitling as the dot turns them into Urdu words,” says Jain of Vaudiot. An electronically manipulated voice in the audio has to be italicised. One needs a hyphen to indicate that a different character is speaking and a square bracket to cover subtitles called descriptive captions. These captions describe in words sounds that are not visually indicated. Like the sound of a phone ringing with no sight of one in the frame. To cut to the chase, Indian subtitlers are now following a style sheet instead of translating as they please. These subtitles go through at least five layers of quality check — manual and automated — before getting rendered into the film. Thanks to this thorough quality check process, Mona Ghosh Shetty is now open to taking up subtitling work. The president of dubbing studio group Sound & Vision steered clear of subtitling work all this while because it was all about undercutting and getting the job done. “Now, clients are quality conscious,” she says. For Manto, she chose the author and filmmaker Nasreen Munni Kabir. Kabir has done English subtitling for over 700 Hindi movies, including some of the most popular movies of last year such as Andhadhun and Mulk. In one of the sequences at the beginning of Manto, a voice announces the arrival of one “Kishori”. The subtitle, however, calls him a “pimp” instead of retaining the proper noun. Why? “Because Nasreen told me some foreign audience might misinterpret Kishori as the father’s name,” says Das. Kabir’s documentary-making experience came in handy with some of the cultural interpretations, she says. “When I’m doing subtitles, I try and solve the problem of comprehension. Your subtitles have to be simple yet elegant,” says Kabir. Jahan Singh Bakshi, a Mumbai-based creative producer, took it a notch higher. 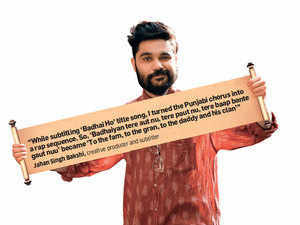 Subtitling Badhaai Ho was fun,” says the 28-year-old who also did the English subtitles for Sacred Games. Bakshi likes his subtitles to be clever and mirror cultural references. “If the character is saying the same thing thrice, I try to introduce variations of the same phrase in English.” He often looks at subtitles while watching a movie and thinks they could’ve been written better. In the case of Rekhs, a subtitler for southern movies, it’s the opposite. If the audience doesn’t like a Tamil film’s English subtitles, they often demand why she wasn’t asked to do them. Rekhs has been a pioneer of sorts for the subtitling industry down south, having subtitled over 500 movies in the last eight years. She has fought with distributors to allow a yellow font for subtitles because she found out from an eye specialist that they are easier on the eye after 40. It won’t be an exaggeration to call her a living, breathing subtitling encyclopaedia. “We have to formulate a ‘Gender Code’ specifying gender and singularity/plurality of characters in the dialogue sheet while sending English subtitles for Arabic translations,” she says. Arab countries — a big market for south Indian movies — require both English and Arabic subtitles for the films. Subtitling is an art, says Rekhs. “You get into the soul of the film to get its soul out through your words.” She takes it too seriously, she admits. And hopes others would do too.